Found along Portugal’s south coast in the Algarve, holidays to Porches allow you to experience the country at its most authentic. This pretty seaside town isn’t just for beach lovers – it’s full of culture and a sense of history just waiting to be explored. Families will love the gently shelving beaches where little ones can paddle to their heart’s content while couples can enjoy a romantic sunset boat trip or the pretty streets of the town. If you’re looking to try something livelier, nearby Lagos is just a 10 minute drive away. Here you’ll find shopping, activities, water sports and theme parks, perfect for families with older children. Hire a car and explore this stretch of coastline where you’ll find plenty of fishing villages, as well as little coves where you can relax with a picnic. Stop off in a family run taverna and try some of the country’s delicious seafood and locally sourced produce or sit in a streetside café and indulge in some people watching. Whether you want to immerse yourself in the natural surroundings or enjoy the upmarket restaurants and bars, luxury holidays in Porches will leave you feeling relaxed. To the north of the town are orange and olive groves, as well as forests and hiking trails. The town itself is home to modern buildings full of luxury hotels and restaurants, as well as winding narrow streets which lead down to the glittering sea. Wine lovers can taste some of the local varieties, while foodies will find opportunities to immerse themselves in Portugal’s celebrated cuisine. At Sovereign we’ve handpicked the very best hotels in Porches to ensure you get the most from your holiday. 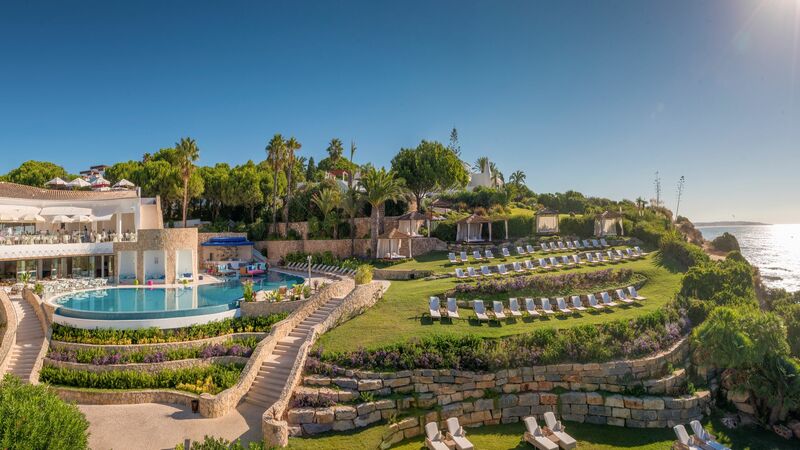 Choose the cliffside hotel VILA VITA Parc where you can experience spectacular views of the seemingly endless blues of the Mediterranean Ocean. Transfer time from Faro airport to Porches is approximately 40 minutes.